Note - if you use TENS to help with coccyx pain, you need to be careful not to use it to mask the pain, sit longer, and aggravate the cause of the pain. It is not a substitute for treatments to remove the source of the pain. However, if you know that there is no remaining physical cause for the pain (for instance after removal of the coccyx), then TENS can be very helpful. 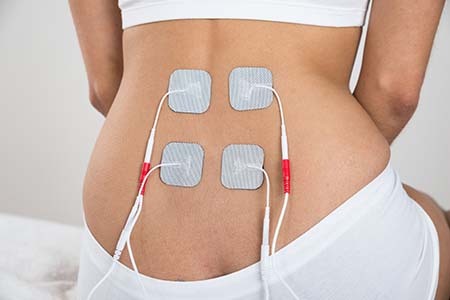 Electrically conducting pads are attached to the skin and a low current alternating voltage is applied between them. Pain may be reduced, possibly on the same principle suggested to underlie acupuncture and scratching to relieve an itch, that stimulation of one part of the nervous system can block signals in another pathway. Research (here, here and here) has shown that TENS can block neuropathic pain (pain caused by the nervous system itself). If sitting sets off your neuropathic pain, you can place the electrodes either side of your coccyx, and switch on the TENS when sitting, and switch it off when you stand up. Diane writes: The signals block out the pain signals you would normally be experiencing. The pack clips to your belt or waistline. It is not a solution, but with pain that will be around a long time, it is another device for comfort. I truly believe it is my savior for being able to work. You can't get dependent on it, so my surgeon thinks it replaces drugs for daytime comfort. Bernadette writes: I've tried everything else and this is the only thing that has helped. I use the unit all day and would be completely housebound without it. From time to time you do need to buy extra pads and leads but it is still cheaper and much more effective than taking drugs. Many people with coccydynia have tried acupuncture - put 'acupuncture' into the search box at the top of the page to see their stories. Some people have found it effective in reducing or removing their pain, but most have found that it didn't work for them, or only worked for a short time. According to the book The Biology of Acupuncture, by George A Ulett and Songping Han, acupuncture can be effective in reducing pain, but traditional explanations of how it works are based on myth rather than reality. Acupuncture can reduce pain in about 70% of people. Some people (and some animals) have little or no response to acupuncture. Research shows that acupuncture works for three reasons: (1) because of the placebo effect, (2) because it causes the body to release endorphins (which are like opiate drugs), and (3) because it causes changes in the nervous system. Its effect is nothing to do with Qi or 'energy meridians'. This book suggests that TENS works the same way as acupuncture, and TENS is preferable. The authors recommend that treatment for chronic pain with TENS should normally consist of a point close to the source of the pain and also through the hand, between the thumb and first finger.